Really inspiring stuff! :-) Just wondered… how did you get invited to that camp? Is this something that we can get involved with in our local community? Certainly, those of us with kit that we use in Jams, together with resources that are out there already, could band together to do similar things with local scout groups. Pop along to http://scouts.org.uk/home/ ,search for any local units and then get in touch with them to offer your skills. Ta. :-) But a unit helper? Not likely! Hmmm! Now if you knew a Scout Leader not too far away who amazingly hadn’t thought about the CamJam resources that could lead to something! I’ll be in touch! We are currently in Pi High Altitude Ballooning preparations but extending that would be great. Pop me an email – probably can’t do anything before Pi Wars, but after that we’ll be looking for ways to do our own CamJam outreach, so we’d like to help if we can! I would like to know where you got the kit that holds the pi and the screen, very cool. Can they be ordered anywhere or did someone make them with a 3d printer? Those are Pi Tops – see https://www.pi-top.com/ if you want to order one. This is great, I love the idea! A really good time to get involved with your local Scout group would be the 20th-22nd October 2017 for the annual Jamboree on the Air/Jamboree on the Internet- this is a global communication-themed cmap where Scouts talk on radios and internet chat around the world. 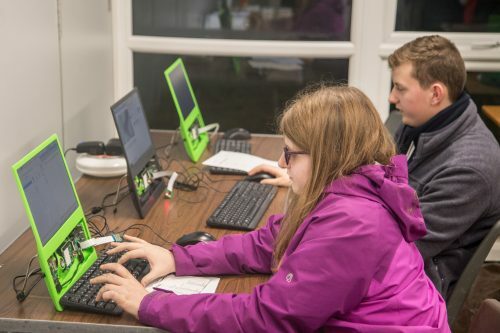 Electornics kit-building, computer gaming and other technology skills are popular side events at these camps, and I don’t know an organiser who would say no to having a local Jam offering assistance. Last year I went into a Beaver Scout Colony to help with their Digital Citizen and Digital Maker badges. That was great fun and as a result I’ve recently just rejoined as an assistant Cub Scout leader. I am now working through both the badges with my Cub pack. 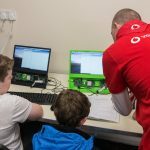 Last week we “built a computer” using a Raspberry Pi, PiDrive etc. Next week we are creating stop frame animation using a Raspberry Pi camera, and at a future date we’ll be playing with Robot Arms using a Raspberry Pi and a GUI that I wrote for it. For those interested in helping, but not committing to become a leader then just get in touch with your local unit. They are often more than happy for you to help out for one or two evenings to work towards the badge with no further commitment. Or you could become a “helper” and help out once a month or so. Be warned though – you may get the bug and like me suddenly take the leap into being a leader. It’s been just over 3 months now and I’m loving it – only wish I’d volunteered to help sooner. I’m somewhat envious! I’ve recently volunteered to help with some of the IT happenings at Gilwell but I couldn’t help with Wintercamp due to other commitments. Yes, I would mostly have been doing work and wouldn’t be able to play with the Pis, but I still would have loved to be in the vicinity of it all! This presumably all took place in the classrooms of “The Lid”, which for those unaware, used to be a barn-like thing that was effectively a roof on stilts, i.e. just the lid of a building, but the name stuck when it was rebuilt with walls and other shiny new stuff like electricity.